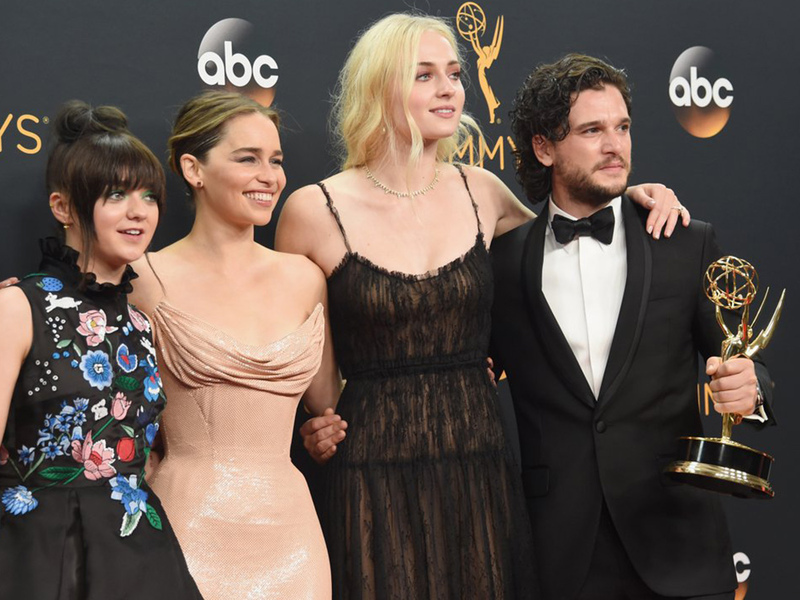 Maisie Williams, Emilia Clarke, Sophie Turner, and Kit Harington of ‘Game of Thrones’ at the 2016 Emmy Awards. Image courtesy of Getty/Michael Kovak. The biggest positive of the Emmys was not a series, channel, or individual winn, it was the diversity of the nominees. Unlike the Academy Awards which were harshly criticized last year via the viral internet slogan, #OscarSoWhite, the Emmys illustrated that at least one area of on-screen media is making strides in the right direction. 21 non-white actors were nominated for awards, in fact Egyptian-American Mr. Robot actor, Rami Malek, became the first ethnic minority to win the award for Outstanding Lead Actor in a Drama Series since 1998. While this year’s Emmy Awards left the entertainment world on an optimistic note, the positive glow was quickly overshadowed by a sad piece of news on September 20th: Angelina Jolie filed papers to divorce Brad Pitt, making the Brangelina era officially over. Instead of mourning the end of true love, rely on something that will always be a constant: red carpet style. Check out The Untitled Magazine’s picks of the best dressed women of the 2016 Emmy Awards below. Emilia Clarke in Atelier Versace at the 2016 Emmy Awards. Image courtesy of Kevin Mazur/Getty. Kerry Washington in Brandon Maxwell at the 2016 Emmy Awards. Image courtesy of David Crotty/Patrick McMullen/Getty. Priyanka Chopra in Jason Wu at the 2016 Emmy Awards. Image courtesy of Jon Kopaloff/Getty. Sarah Paulson in Prada at the 2016 Emmy Awards. Image courtesy of Getty. Olivia Culpo in Zac Posen at the 2016 Emmy Awards. Image courtesy of Patrick McMullen/Getty. Regina King in Elizabeth Kennedy at the 2016 Emmy Awards. Image courtesy of Tod Williamson/Getty. Natasha Lyonne in Sally Lapointe at the 2016 Emmy Awards. Image courtesy of Kevin Mazur/Getty. Padma Lakshmi in Naeem Khan at the 2016 Emmy Awards. Image courtesy of Tod Williamson/Getty. Laverne Cox in Naeem Khan at the 2016 Emmy Awards. Image courtesy of Getty. Niecy Nash in Christian Siriano at the 2016 Emmy Awards. Siriano also dressed Angela Bassett, Neve Campbell, Maura Tierney, Anna Chlumsky, Laurie Metcalf, Kathy Bates, Lauren Adams, and Leslie Jones. Image courtesy of Getty. Kristen Bell in Zuhair Murad at the 2016 Emmy Awards. Image courtesy of Tod Williamson/Getty.